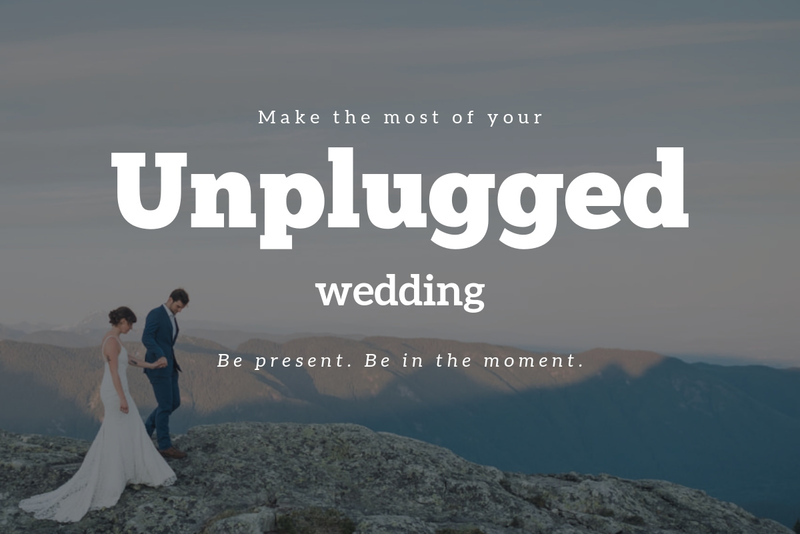 When you’re planning your wedding, you’ve probably come across the term “unplugged” before. In case you’re not familiar with it, it means not having guests take photographs during the wedding. Mostly when someone says “an unplugged wedding”, they mean an “unplugged wedding ceremony”. So no camera’s, cellphones (or worse, IPads!) during the ceremony. Some couples go further and want other parts of their wedding day to be unplugged as well. My goal for this post is to create awareness about what you can do to make sure your guest’s phone enthusiasm doesn’t interfere with your wedding. 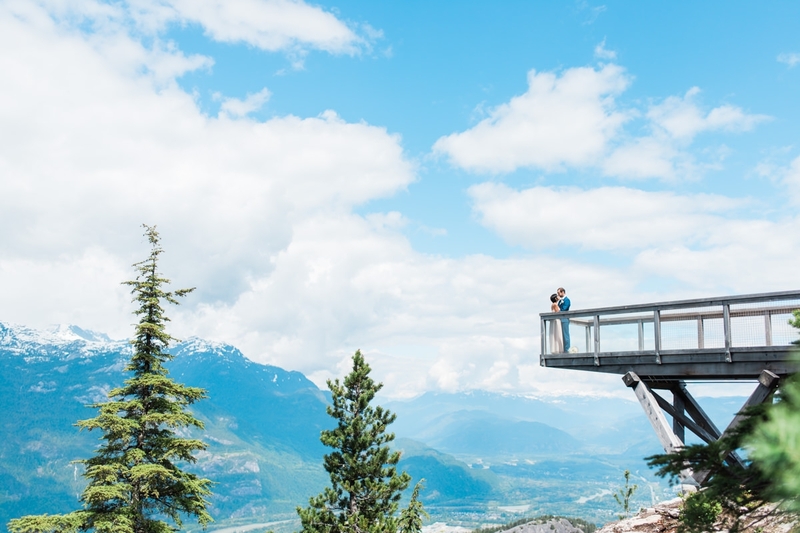 Disclaimer: I’m purposefully not using our client’s photos in this blog post. I don’t want to shame any of our couples (or their guests) by using their wedding images to prove my point. Check out this blog if you want to see what can go wrong in photos. During the getting ready or before the ceremony, the excitement runs high. While it may seem obvious, it can take over and makes us forget what’s most obvious: the surprise. 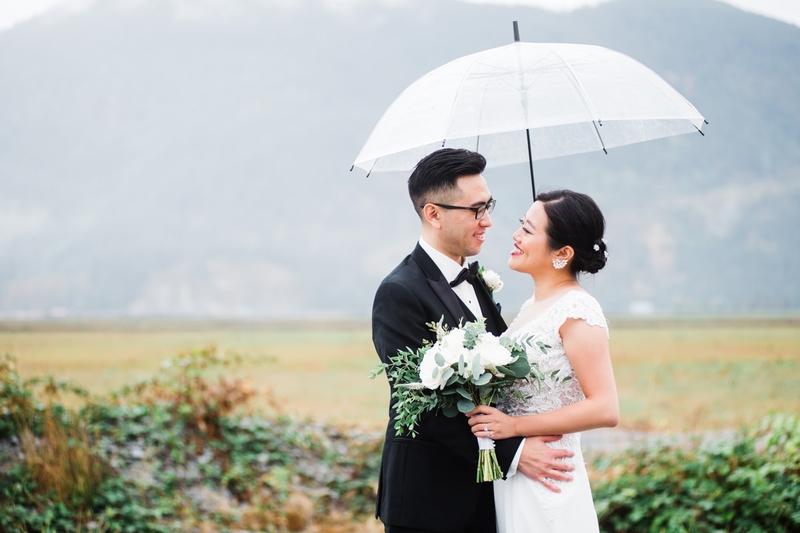 The wedding couple hasn’t seen each other in full wedding outfit yet, and have planned the moment they’d like to reveal themselves. A quick snap-in-the-moment social media share can be a sad and unintended end of the excitement. 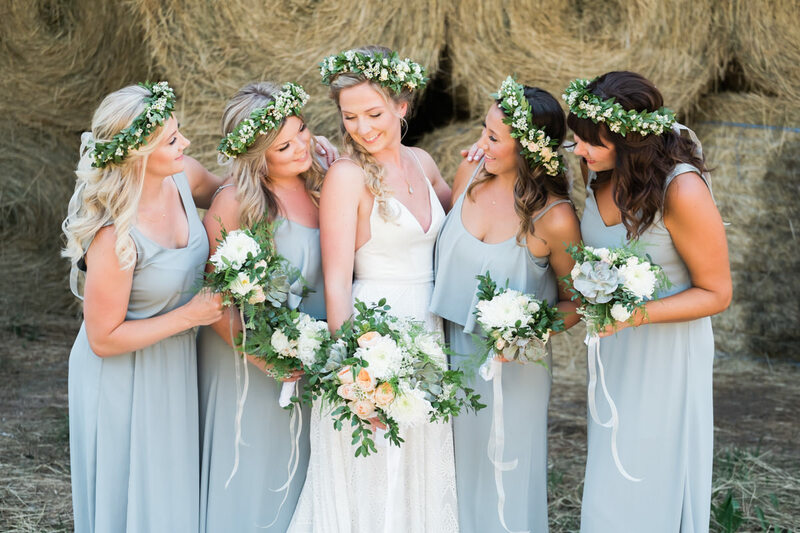 In the past, I’ve known bridesmaids or enthusiastic family members post photos of the stunning bride on their snapchat or insta stories, which the spouse discovered when browsing through their feed. Preventing this is easy. Right before getting dressed, remind everyone not to share pictures online, until after the wedding ceremony. 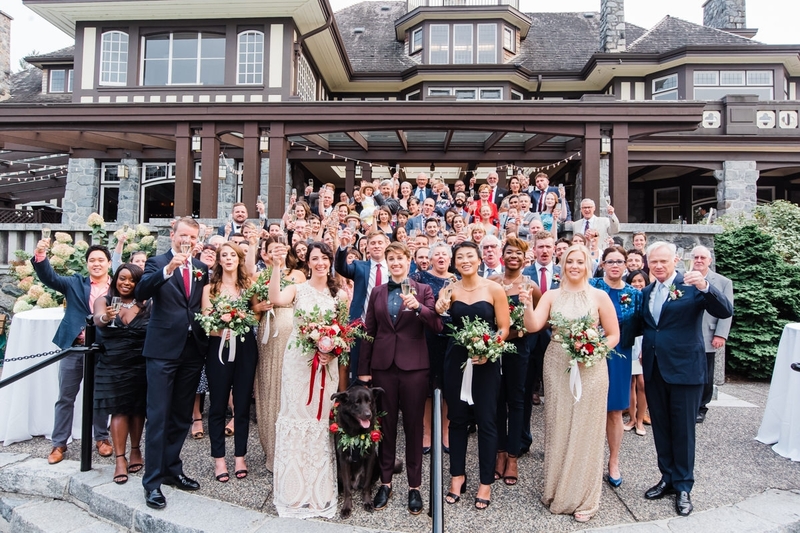 Of course selfies are still allowed (after all, they’re part of the fun), but just put an explicit “no posting policy” in place until the wedding couple has seen each other. Next is the wedding ceremony, which you may want to unplug for two reasons. First, it keeps your guests present in the moment, and allows them to fully experience the heartfelt moments of your wedding ceremony. It’s easy to forget how hard it is to have a similarexperience when we’re looking at a phone or (gasp!) tablet. Of course it’s important to have photos and/or video of your wedding vows, but that’s why you’ve hired professionals. Second, from a photographic point of view, an unplugged wedding looks considerably better in your photos. During the wedding ceremony, we also photograph the guests, especially the ones in the first row. Which means that if they are holding a camera in front of their face throughout the ceremony, that’s what we’ll photograph. Of course it’d be much nicer to portray them listening and reacting. Which brings us back to the use of unplugging your wedding ceremony. Talk to your family and friends long before the wedding day. Explain to them why you’d appreciate them to be fully present during the wedding ceremony. If needed, show them an example of what could happen otherwise (like this photo where the groom barely sees his bride). If you know any of your family members or friends are avid camera enthusiasts, offer them the to take a few photos at the beginning of the ceremony, and then to put the camera/phone away. 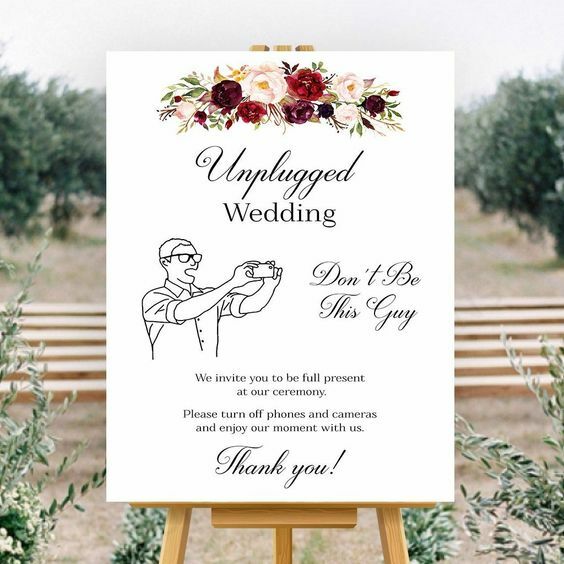 Put up signs with your request for an unplugged wedding at the entrance to your ceremony. You can make it as explicit or subtle as you like, but I especially love the example below. It gets the message across perfectly. Etsy is a great source for printable designs and ready-made signs. Note that people will not always pay attention to a sign or sometimes even choose to ignore it. You can find this sign here. At the beginning of your wedding ceremony, have your officiant make the formal announcement of your unplugged wedding. You could even add that you’d love love to see your guests’ faces, rather than the back of of their phones. And of course that you’d want everyone to be present in the moment, together with you. In my experience, despite your best efforts, there’s a good chance there will be ‘the one person’ still taking photos. If that happens in your case, don’t feel upset about it. You did your best, and that’s more than enough. Your professional photographers can and will deal with it. Especially if said person is not in the front row. I’ve met couples that’d love for the entire day to be unplugged. To be honest, that’s asking a lot of your guests. Social media and phones are literally addictive. Some people start feeling physically uncomfortable after not using their phone for a while. Crazy, right? That said, if you’d like to unplug the reception, choose your method according to your motivation. If it’s because you prefer the first photo on your Facebook feed not to be one of you at the “final (drunk) hour of the reception”, it’s easier to temporarily change your privacy settings on Facebook. You can set it to monitor and which tagged-with-you photos appear on your timeline and which don’t. Lastly, if you’d like to unplug your reception for any other reason, communicate this early and repeatedly. Put your intention on your invitations, then send out an email to your guests and have both your officiant and MC repeat it again. That said, know that your request may be too much to ask for some people. Know your guests and whether they can handle an entirely unplugged wedding day. I hope these tips were helpful! 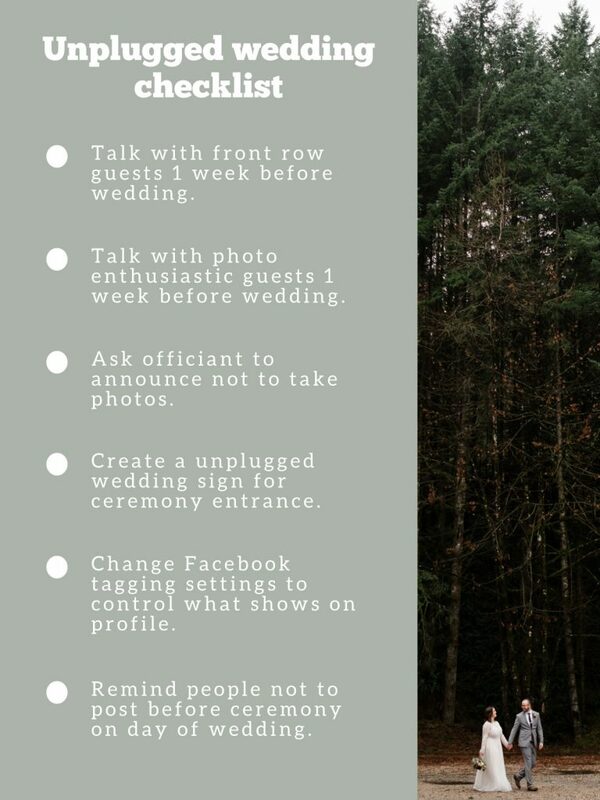 Check out more wedding planning tips here! And don’t hesitate to get in touch if you have any questions about this post! PS: Have fun with this video below! 😉 I loved it on so many levels, lol. As a photographer I can relate to EVERYTHING that happens in it.